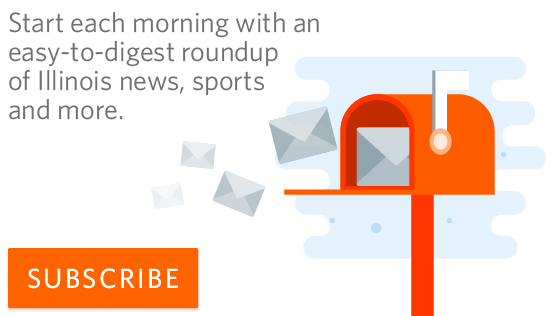 Alex Diab works the still rings against Minnesota at Huff Hall on Jan. 28. 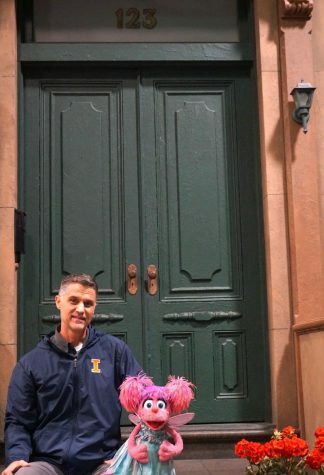 Illinois came in third at last Sunday’s national championship. 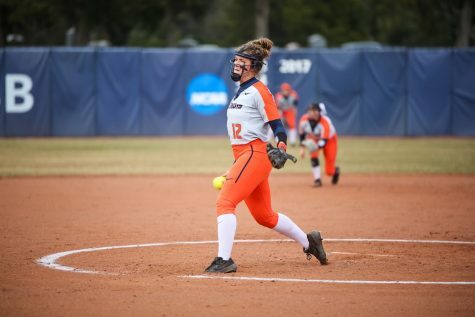 The Illini concluded their season Saturday, narrowly missing the ultimate goal of any NCAA team: a national championship. Army hosted the meet at Christl Arena, in West Point, New York. 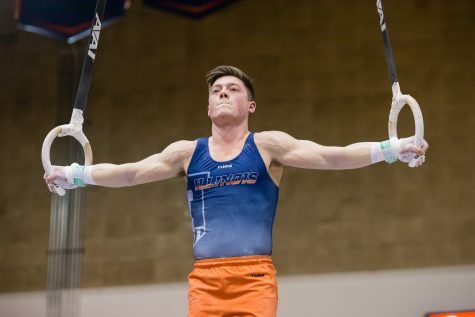 Illinois finished third with an overall team score of 422.100, and four gymnasts — junior Bobby Baker, sophomore Alex Diab, junior Chandler Eggleston and junior Brandon Ngai — earned six total All-American honors. 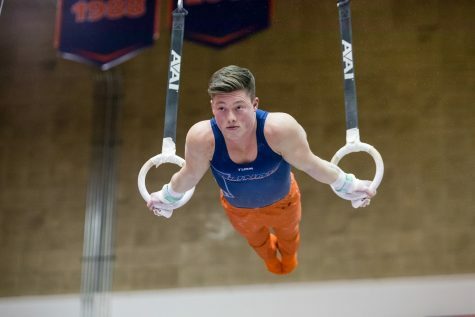 Baker and Eggleston were recognized in two separate events; Baker was recognized on rings (14.600) and vault (14.800), while Eggleston excelled on floor (14.400) and high bar (14.600). Eggleston’s 14.600 on high bar was good enough for a second-place finish. 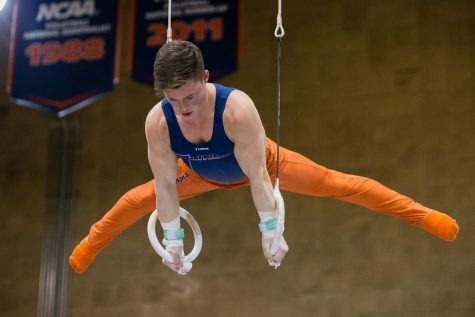 Diab finished seventh on rings (14.650), and Ngai tied for fourth on pommel horse (14.800). Oklahoma brought home a third-consecutive title, securing another undefeated season and finishing with 431.950 team points. The Sooners have not lost a college meet since finishing second at the 2014 NCAA championship. Coming off a Big Ten championship in Champaign, Ohio State placed second, recording 423.700 team points. Stanford, Minnesota and Nebraska rounded out the remaining top-six, recording 421.500, 414.200 and 421.900 team points, respectively. Stanford senior Akash Modi won the all-around title. Less than a point separated him from Oklahoma teammates sophomore Yul Moldauer and senior Allan Bower. 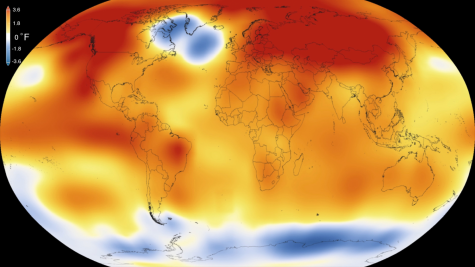 Penn State, Iowa, California, Air Force, Michigan and Navy competed Friday, but did not qualify for the final round of competition. The team scores determined placement from the two separate sessions of qualifying rounds. On Friday night, Illinois scored 421.600 in the second qualifying round. 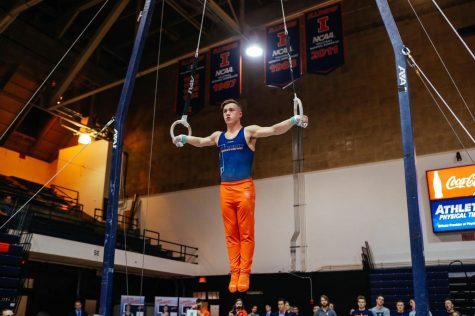 On Saturday night, Illinois began on vault. The team started strong with Baker and Diab tying season-best scores, 14.800 and 14.600 respectively. 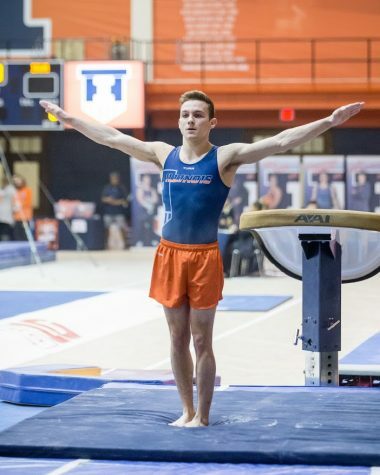 After the first rotation, Illinois led the field with a score of 72.550. After the third rotation, Illinois sat in third behind Oklahoma and Stanford. The Sooners surged ahead by 3.800 points and wouldn’t relinquish the lead for the remaining duration of the meet. Seven Sooners earned a combined total of 22 All-American honors. 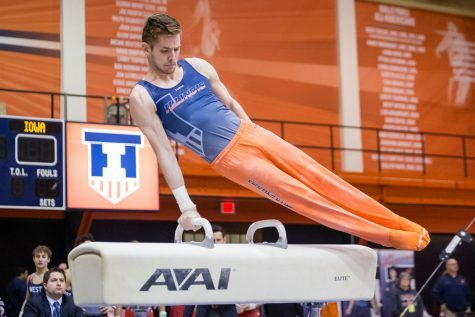 During the fifth rotation, Illinois competed on pommel horse. 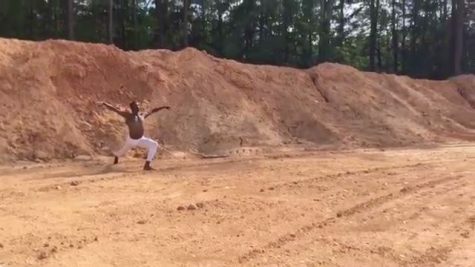 Senior Tom Gibbs lead off, recording a season-best 14.100, and Ngai — the defending national champion in the event —concluded the set with a score of 14.800. 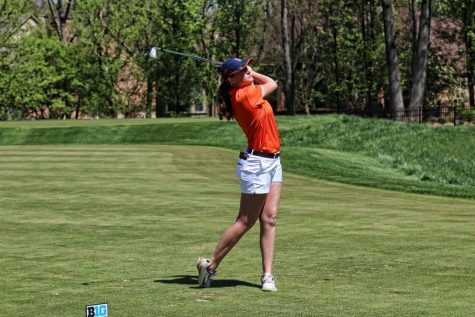 The Illini finished with a team score of 70.000 in the event, which for them was the third-highest mark of the season. 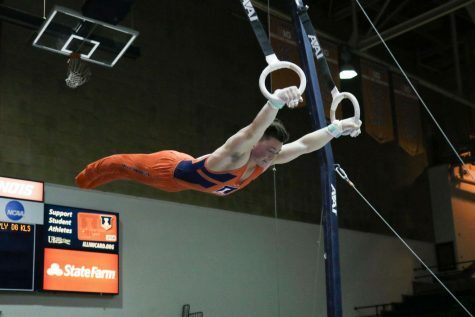 Illinois ended the night on rings, well behind Oklahoma by 10.100 points. 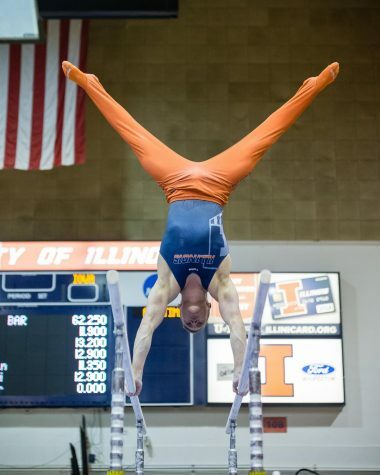 However, the Illini performed at a high level in the event, recording a team-high score of 70.500. 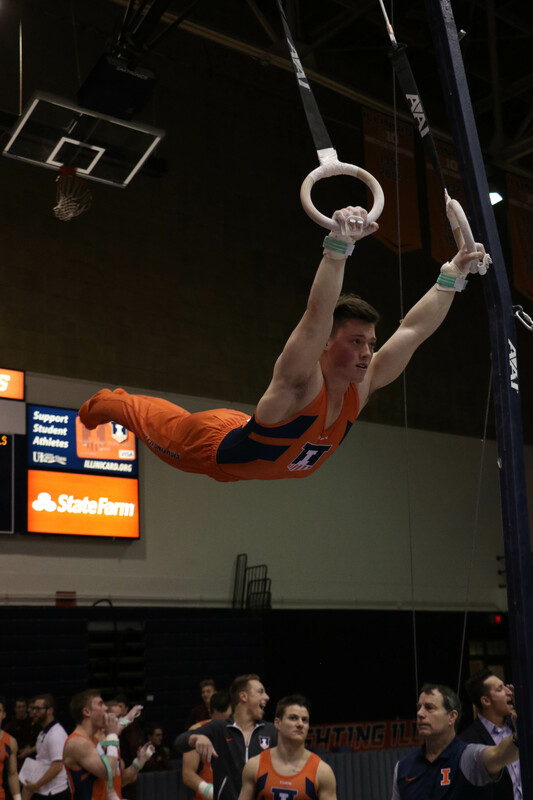 Diab concluded the night scoring 14.650 for the Illini, which later earned him All-American honors. “Our best guys were injured and not at their best, so a lot of guys had to step up, and we had good, consistent gymnastics,” Spring said.